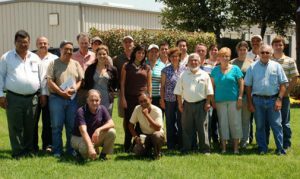 The SynTech Research teams of Latin America had their first regional workshop at the US headquarters in Sanger, California during between 27 and 31 July 2009. The key objectives of the workshop were to share / learn best practise and to receive training in key technical and IT needs. The team received training in safety, standard procedures, GLP (EPA/OECD), GMO as well as the use of ARM. The workshop also provided the team with the opportunity to meet with some key USA agrochemicals companies. The event was a great success and culminated in an annual family BBQ.